From left, graduate student Alex Griffin and Ph.D. candidates Eli Hernandez and Hayder Alghazali work with professor John J. Myers on the design and construction of a new highway bridge that uses new longer-lasting concrete beams developed at Missouri S&T. Photos by Terry Barner. The Highway 50 corridor that connects Jefferson City, Mo., to Union, Mo., will get upgraded into four lanes by spring 2014, but it’s a new and improved three-span bridge that’s capturing all the attention. That’s because it’s one of the nation’s first bridges to incorporate an unusual concrete mix in its girders and support structure. It’s another milestone for John J. Myers, a professor of civil, architectural and environmental engineering at Missouri S&T working with the Missouri Department of Transportation and Missouri S&T’s National University Transportation Center. 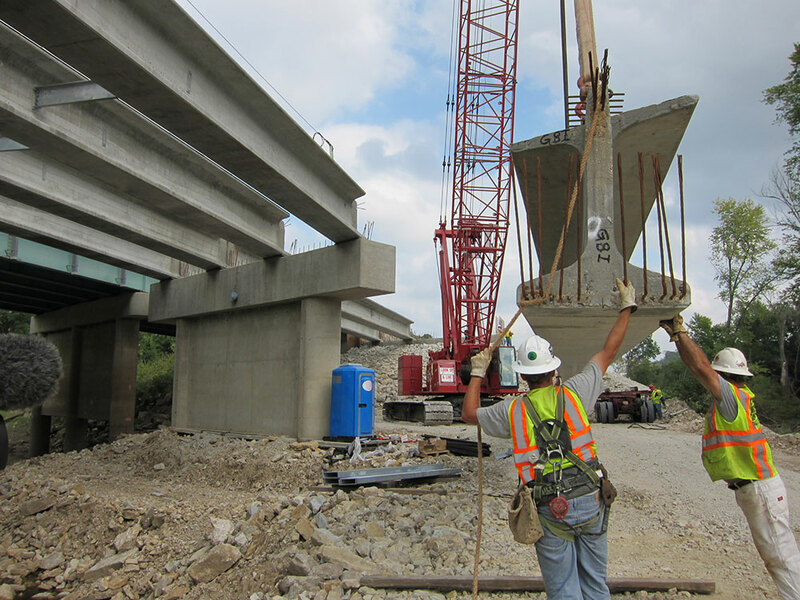 Myers has spent the past decade studying and testing high-strength concrete and other innovative concrete systems for implementation. The new bridge combines three different types of concrete grades in the girders. The first 100-foot span uses traditional concrete. The second, 120-foot span, uses high-strength, self-consolidating concrete. The final span uses self-consolidating concrete. Using sensors embedded in the material, researchers can monitor to see any differences as they occur. The bridge also includes instrumentation that will allow the research team to collect important data during load testing and normal in-service conditions. “The advantage of having one bridge demonstrating four to five types of concrete throughout the entire bridge is that you know the exposure conditions, salts, temperatures, weather conditions are all identical,” Myers explains. In addition, one intermediate support will use concrete with a high-replacement level of fly ash, fine particles from coal are the by-product of a power plant’s combustion process. 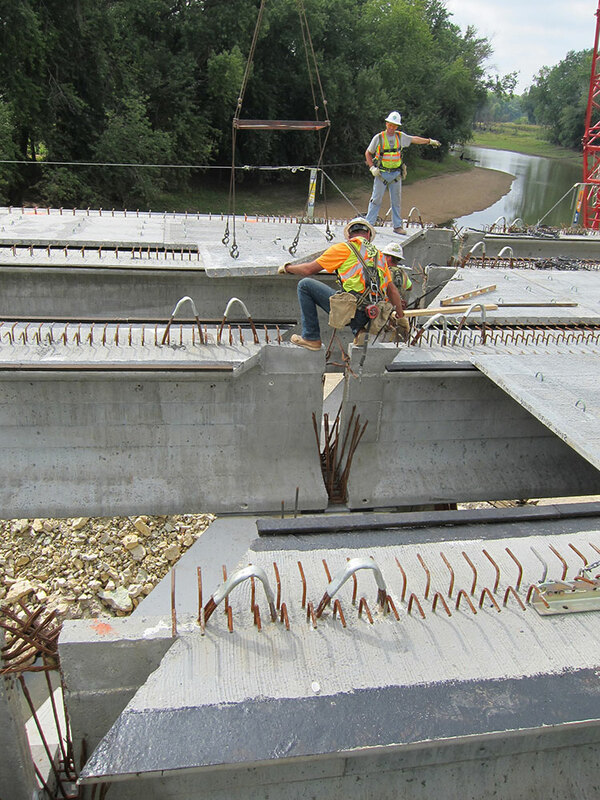 The state’s first bridge to use high-strength, self-consolidating concrete was constructed in 2009 in Rolla and led by Myers’ research group. The bridge, designed for rapid construction, was one of two built to demonstrate the mechanical and material properties of high-strength concrete and high-strength, self-consolidating concrete. Story by Mindy Limback; video and photos by Terry Barner. Sincere determination, serious efforts, same spirit and zeal, you make me and your friends proud. I wish you a hearty Congratulations on this pleasant occasion. Thank you so much Seaar.